The key to a rich and hearty soup or stew is the stock or base of the soup. 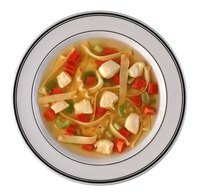 Professional chefs use soup bones, which give the soup a richer and more flavorful base. Butchers and meat counters stock the leftover bones for those who need them; but you often must ask for the bones, as they are not sold in the display areas. The bones come from different types of animals, including lamb and cows. Also known as stock bones, the bones are essentially pieces left over from the butchering process. When the butcher sells boneless roasts and other pieces of meat, he must remove the bones. Each piece typically has a small amount of meat still clinging to the bone. The meat is not enough for a full meal, but it is enough to impart more flavor into your soup. Bones sold as soup bones typically come from the shin or neck. Dice onion, celery and carrots into small pieces and place inside a heavy stockpot with a small amount of oil or butter. Turn the stove on low and cook the vegetables until they are slightly translucent but still raw. Add the soup bones and stir, incorporating the bones into the vegetables. Cover the mixture with water or stock, making sure that you use enough liquid that it completely covers the bones. Place the lid on the pot, and simmer over low heat until the liquid reduces by half. The liquid pulls the flavors out of the bones and leftover meat, making a rich and hearty stock. Strain the mixture, and use the liquid as a base for your soup. Some stores sell soup bones as “dog bones,” which pet owners use as treats for their pets. Dog bones are generally less expensive and, in some cases, are given away for free when a customer asks. The free or cheaper dog bones often have less meat left clinging to the bone. Soup bones may have marrow left inside the bone, which gives your soup even more flavor. When shopping for the bones, ask your butcher about the differences between the two types of bones. According to the article "Making the Perfect Soup Stock" on the website Better Times Info.org, roasting the bones creates a more flavorful stock. Roasting slowly melts any fatty pockets in the bones, including the marrow. Place the bones in a shallow roasting pan and top with enough water to coat the bottom of the pan. Roast the mixture over low heat for at least one hour.